Should I do Lump Sum Investing or Dollar Cost Averaging? 1:31 - What Vanguard, one of the biggest fund manager in the world found to be best for investors. For new investors out there, making the right decision between these two investing styles, can be challenging. But that is about to change today because I’m going to tell you all about it. What is Lump Sum Investing? 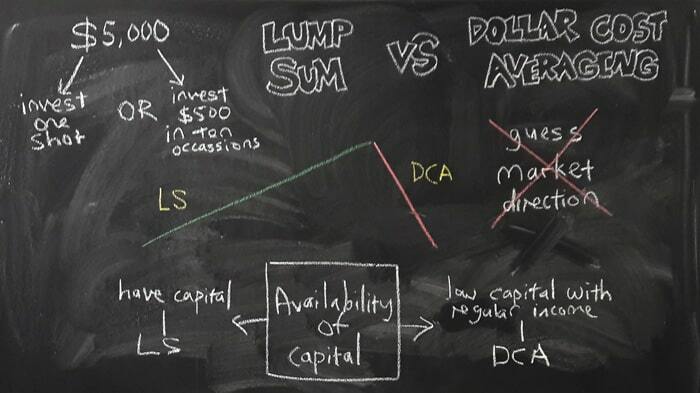 Lump Sum Investing is simply investing the entire investment capital you have, all in one shot. Investopedia defined it as a one-time payment. On the other hand, Dollar Cost Averaging pertains to breaking down what you have into smaller amounts. Say you have $5,000. Lump Sum Investment means investing the $5,000 as a whole in one go. Dollar Cost Averaging, in contrast, is breaking down the $5,000 to smaller amounts. For example, over ten months, you invest $500 each month. Therefore, you will use up all of your $5,000 only after ten months of investment. Now that we know this, what are you going to choose? Well, this is what a study conducted by Vanguard (one of the largest investment fund companies out there) found. In this study, they compared Lump Sum Investment and Dollar Cost Averaging to find out what is better for investors. 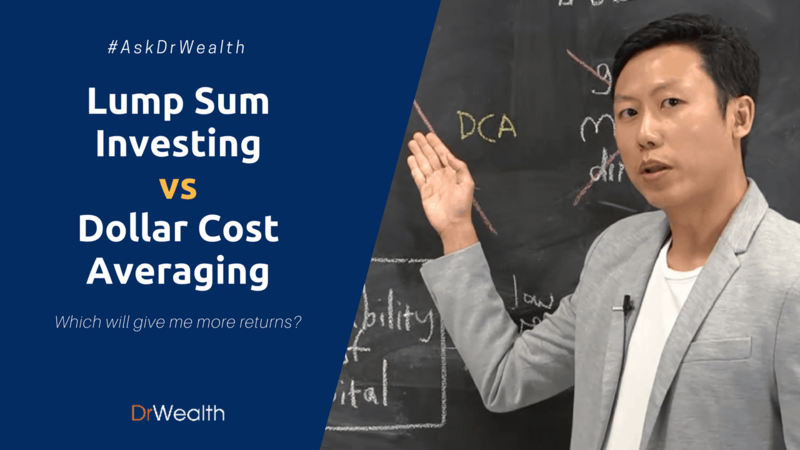 Which is Better: Lump Sum Investment and Dollar Cost Averaging? In short, both lump sum investing and dollar cost averaging works. But they do favor different market conditions. When the market is on an uptrend, it's definitely more worthwhile to do Lump Sum Investment. For example, if you invest $1,000 during an uptrend, it will continue to increase to $2,000 overtime. It would make sense to put in as much of your capital as early on as possible, because you want to capture as much of the growth as possible. If you were doing Dollar Cost Averaging during an uptrend, and breaking it down your investments into $100 every month, then it would get more and more expensive. You will then end up buying fewer shares over time. Hence, when the market is on uptrend, it is definitely better for you to do Lump Sum Investment. You would get a higher return at the end of the day. On the other hand, when the market is at a downtrend, then it would make much more sense for you to do Dollar Cost Averaging. As the prices keep getting cheaper and cheaper during a downtrend, it would make more sense for you to delay your investments such that your future investments will land you more shares for the same amount of capital. Vanguard’s study found out that almost 2/3 of the time, Lump Sum Investment did much better than dollar cost averaging. While during the other 1/3 of that time, Dollar Cost Averaging did much better than Lump Sum Investment. This is actually logical because when you look at the market over long periods of time, the market is actually on an uptrend most of the time. It is only during the few times that the market crashes that it goes down. These downtrends usually occur in very sharp manner, which is very fast and short-lived. The typical scenario is that the market would usually go up slowly, lasting for a span of 7 to 10 years or even more. Whereas when the market crashes, this would probably only last for about a year or two. Put simply, the market is usually on the uptrend. Must I Know The Direction of The Market? Now if you have been following our discussion, you'd probably be wondering if you must know the direction of the market in order to choose between Lump Sum Investment and Dollar Cost Averaging. Fortunately, the answer is 'NO'. Because nobody is able to accurately predicted the future direction of the market. In other words, it would be almost impossible to know which direction it is going and hence, which method would be a better choice. Therefore, choosing between these 2 methods is not a matter of catching the market direction. How to decide if Lump Sum Investing or Dollar Cost Averaging is for me? The #1 question you should ask yourself first is: "How much capital do I have available right now?". 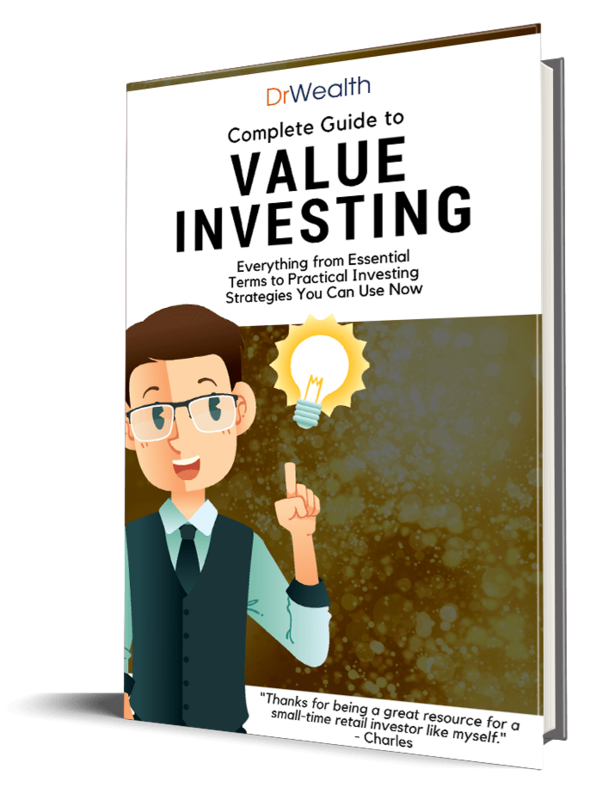 If you already have quite a sizable amount of capital to invest, it would make sense for you to just do a Lump Sum Investment rather than Dollar Cost Averaging. On the other hand, if you have a smaller amount of capital but have a regular income streaming in, Dollar Cost Averaging would be more suitable for you. We've learnt today that during an uptrend, Lump Sum Investing gives us better returns, while during a downtrend, Dollar Cost Averaging works better. But! 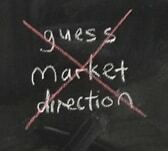 You do not need to know or predict market directions or trends. Instead, if you are deciding between Lump Sum Investment and Dollar Cost Averaging, your decision should always be anchored on how much capital you have available for investing. Leave a comment below and let me know if you have any questions about lump sum investing vs dollar cost averaging. Or, if you have any investing question that you'd want me to talk about in our next video. I hope you found today's video insightful and practical for your own investments! Should You Do Dollar Cost Averaging or Lump Sum Investing? This all makes a lot of sense. What about ETF’s though? I hear that when investing into an ETF, they will often charge brokerage fees each time you buy new stocks and therefore, it would tend to always make sense lump sum investing, assuming those brokerage fees are fixed, and not percentages?